I seem to recently start these updates with new pictures of the rising building. 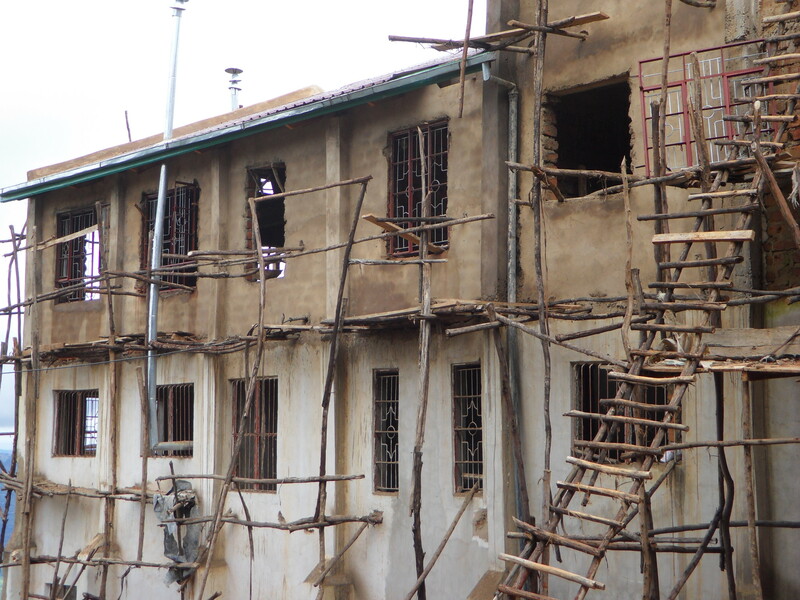 It is already home to our boys and will house all 47 residents when it is completed. 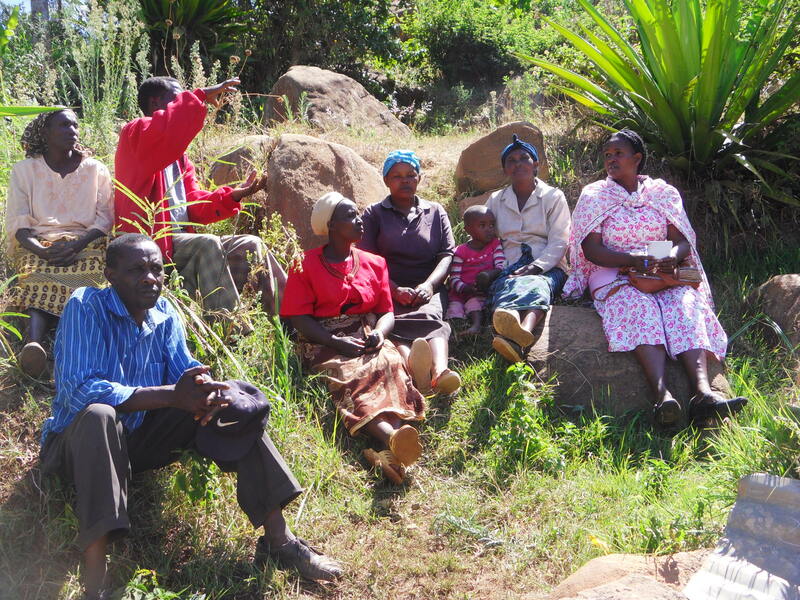 The official opening will happen in July when we have a dozen of our sponsors visiting from Canada, members of the Kenyan government, and hundreds of Kikima residents who have partnered to build and support our project. As the outside is being finished the inside is being furnished. 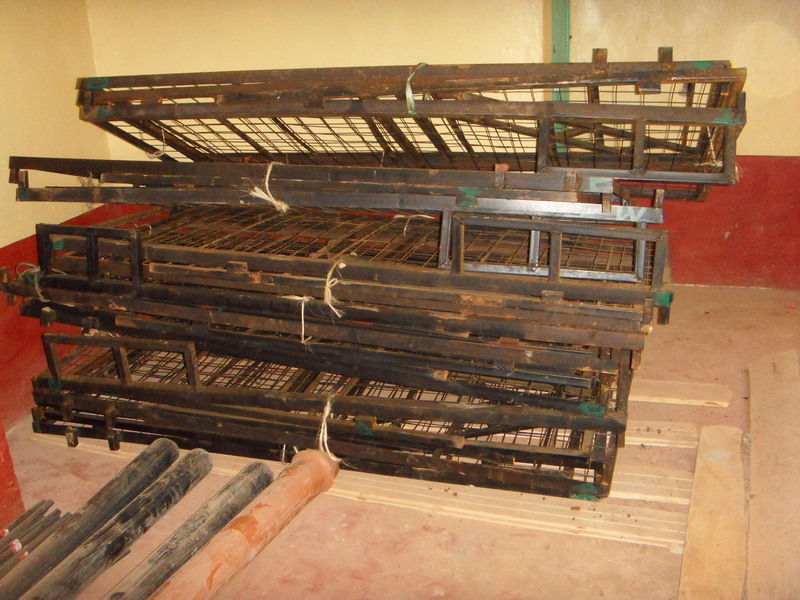 It has taken a very long time to get these bunk beds made and finally delivered to the property. 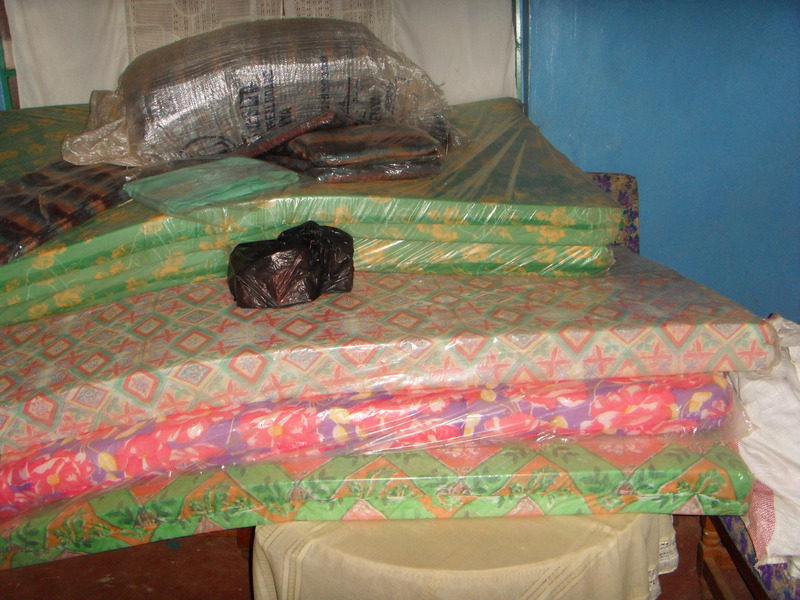 Here are 7 beds, complete with mattresses, bed sheets and blankets, we were able to make with the generous donation you brought along. I want to recognize the following people, including you and Andrew, who donated their money to make this possible. Please pass along our deepest appreciation for this great offer. 4. Kristina Renzella and Lorne Allan from the Bank of Montreal. 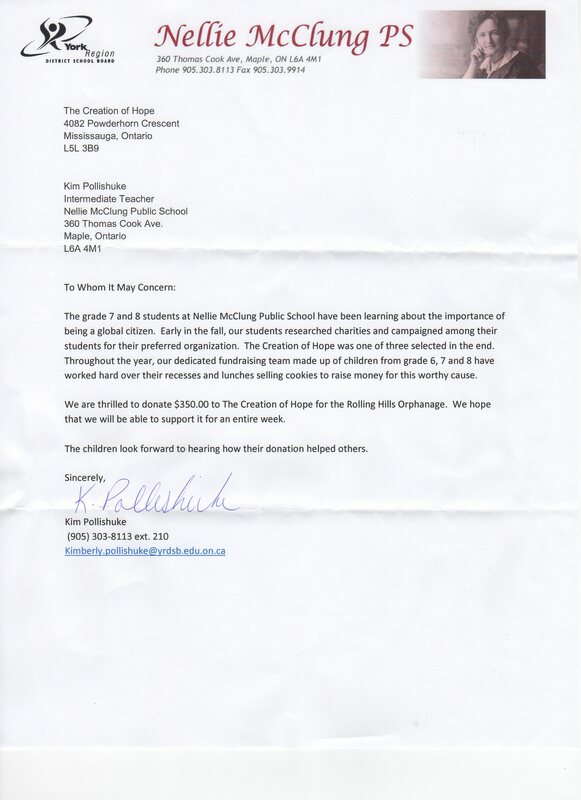 I also mention those who donated books – Placidi Family, Burlington, Ontario. Thank everyone personally for this great service. The dining hall – the Whitehorse Room – is finished and is now being filled for use. 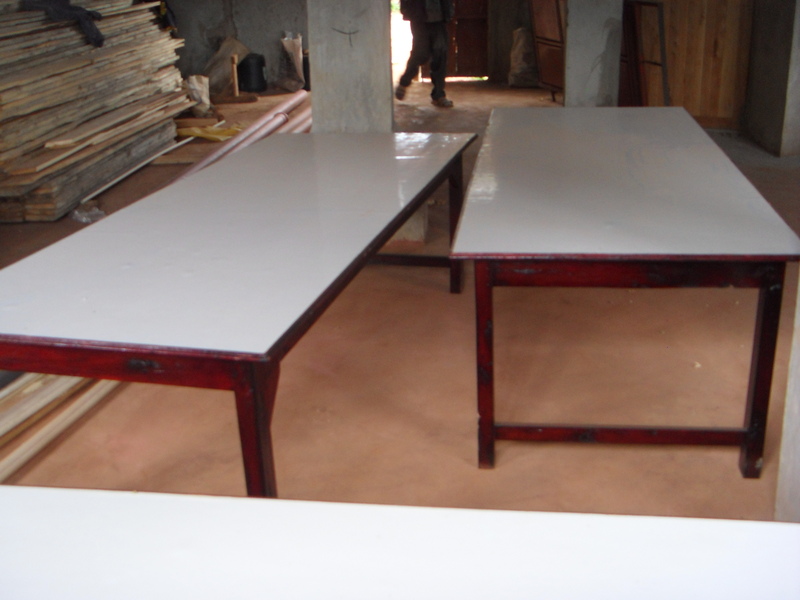 Barb and Sakina funded these tables for the dining hall. 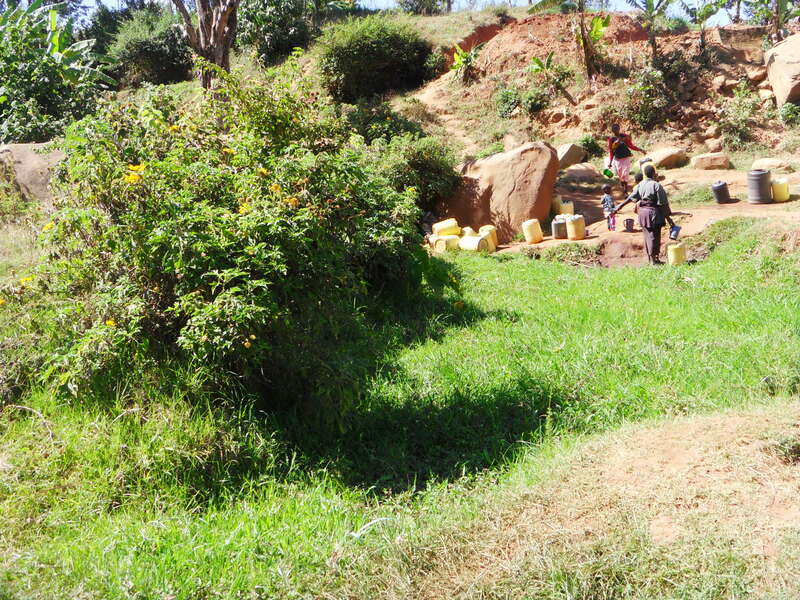 This is a little ‘trickle’ coming out of the rocks that provides water for hundreds and hundreds of people in the valley below our orphanage. It takes a long time to fill each container as the water is scooped out of the mud and there is always a long line. 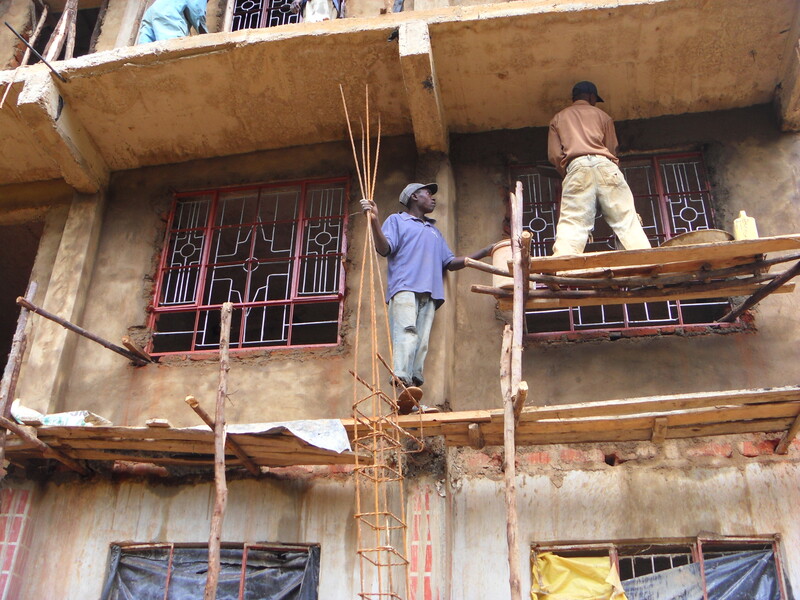 Hope Development staff met with the community members and a partnership has been struck to rehabilitate this project. 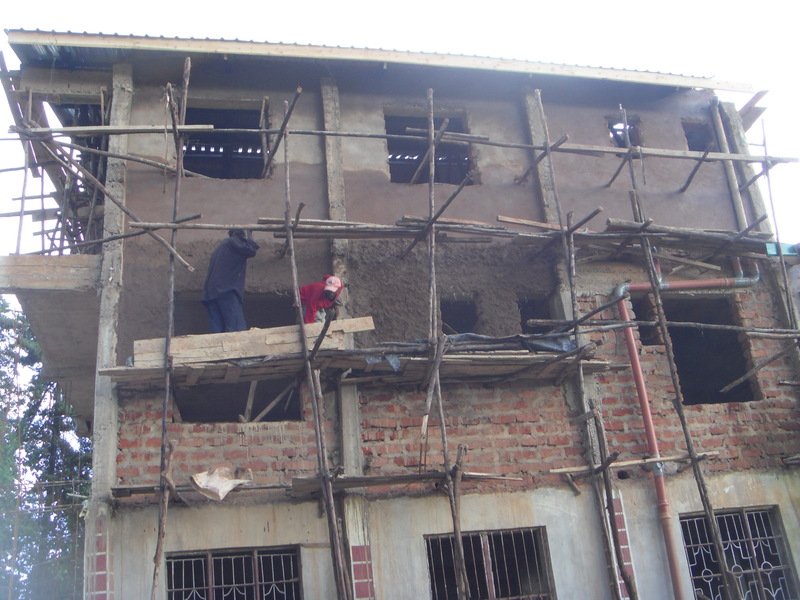 We will provide iron rods, cement, piping, and the expertise of a stone mason and water manager and the community members will provide sand, gravel and labor. The hope is that this project will be completed in July in time for the dedication to take place. This project is being supported by Ryan Rumsby’s school and private donations. It will cause such a transformation in the lives of this community. 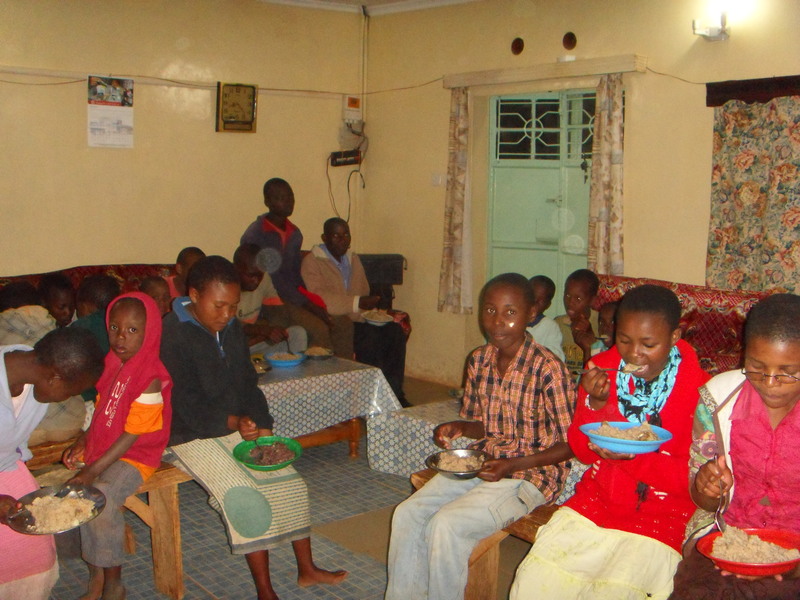 There are four separate groups of Canadians heading to Kikima this summer – in total 26 people. They will be staying on the grounds of the orphanage, volunteering at the local school, meeting sponsored children, visiting homesteads, attending the official opening of the Rolling Hills Residence and becoming more aware of the work of the project and the issues of the community. As with all our visits – including my yearly trips – all parts of travel and accommodation are funded by the individual. 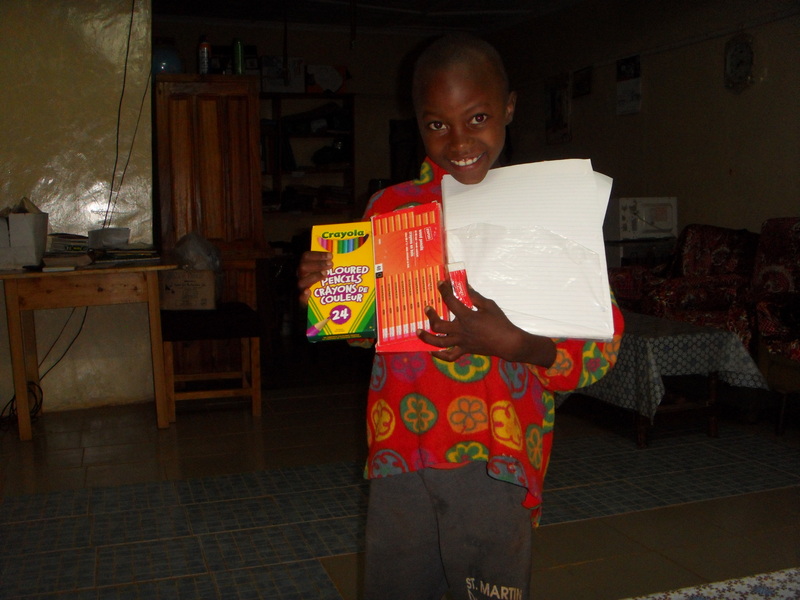 No money donated to the project EVER goes to anything except service to the community. Our Canadian visitors will come home with an understanding of the project and its impact that they could only gain from such a personal experience. 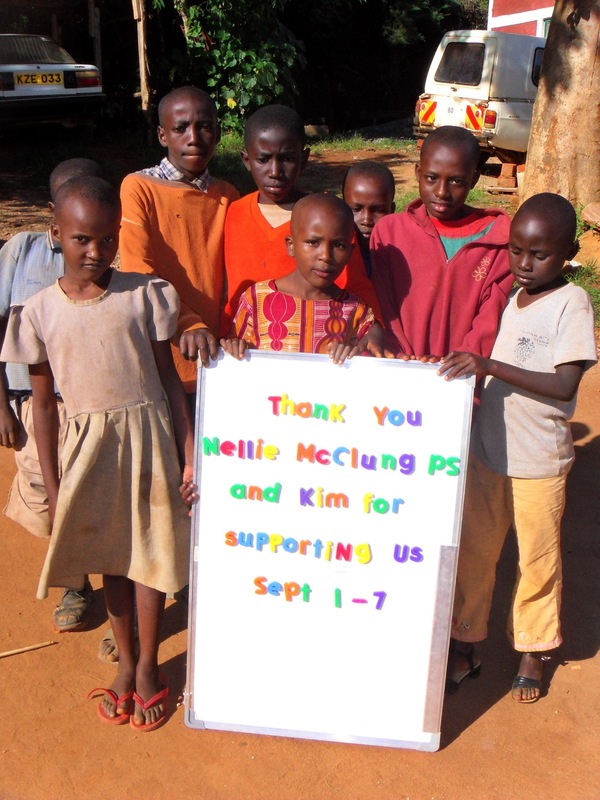 Many schools have provided daily support for Rolling Hills Residence. $50.00 provides food for 47 residents, their medical care, clothing, school supplies, the salaries of the matron, night watchman and tutor, and the electricity, water and sanitation for the entire building for one day of operation. My children, at my two schools in Hamilton, had Gently Used Books Sales to raise money for your special orphanage in Africa. 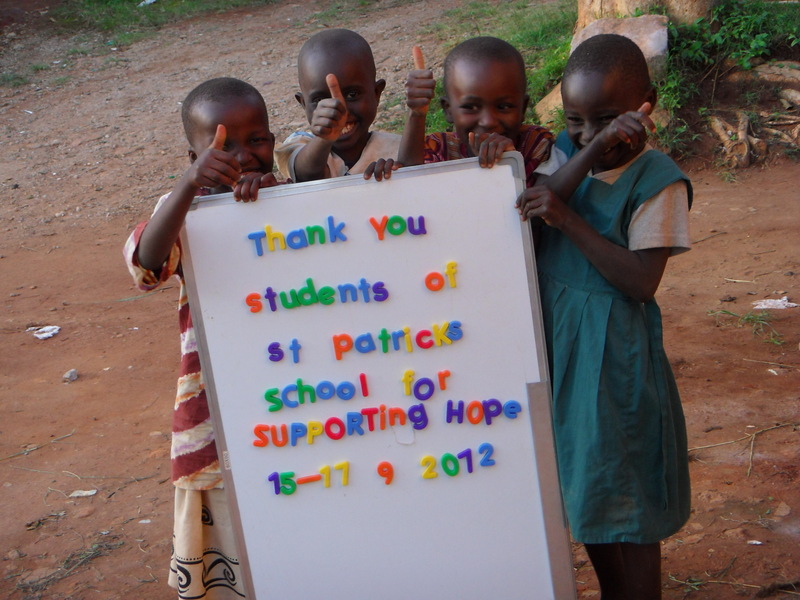 St. Patrick’s School raised $142.64 and St. Marguerite d’Youville raised $100.81. 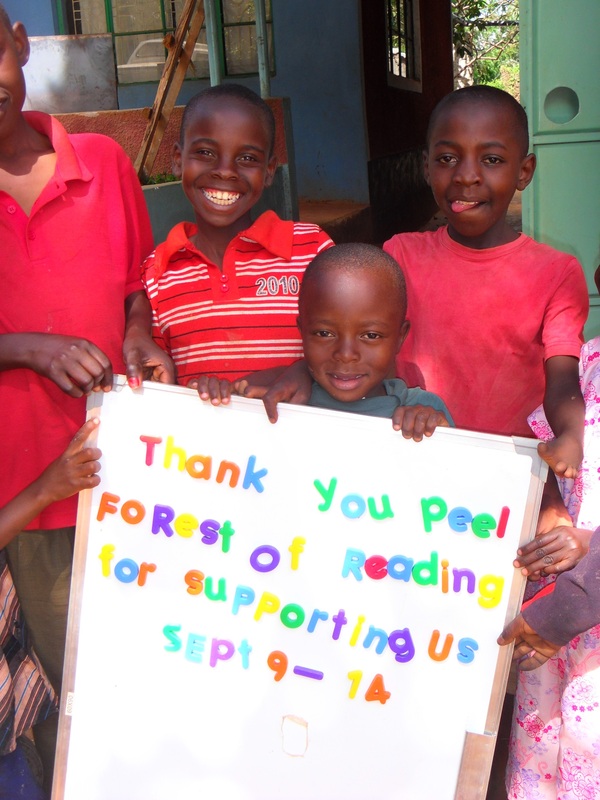 Keep making a phenomenal difference in the lives of so many children! St Francis Xavier in Ottawa, under the leadership of Debbie Campbell donated $325.00 which was used to support the 47 residents of Rolling Hills. 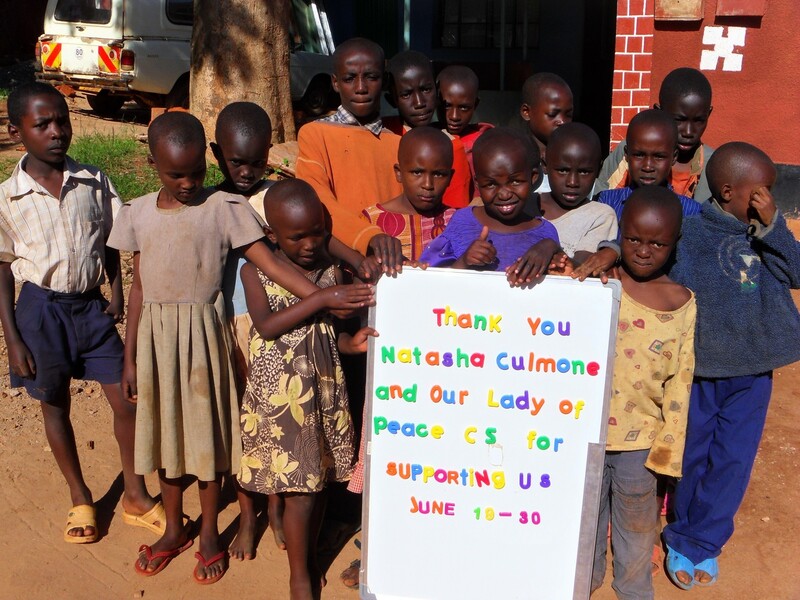 You recently visited Our Lady of Peace School in Etobicoke. We were very inspired by your presentation and the connection you made to our faith. It is always wonderful to see someone using his/her life to make a substantial difference in the world. As a result of this inspiration, we sold jewellery for Mother’s Day and raised over $2000 for your charity, “The Creation of Hope”. 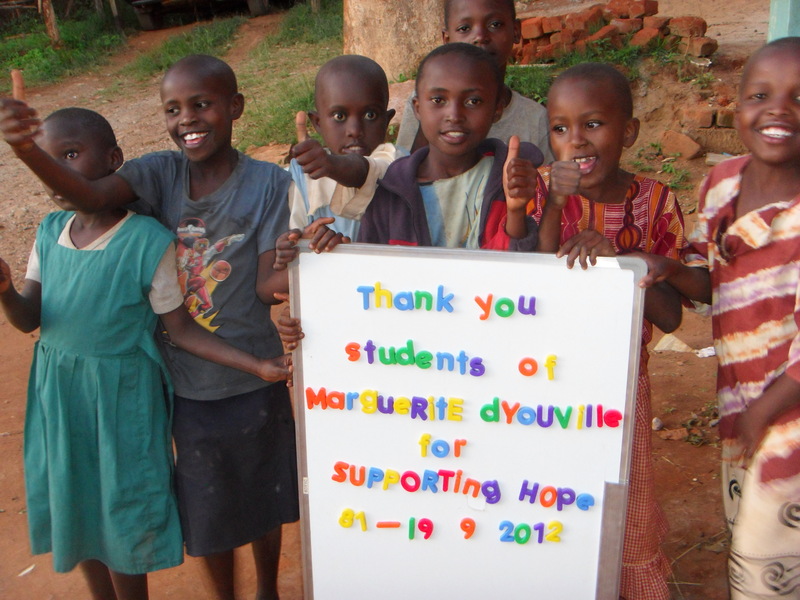 We would like to know to whom we write the cheque and could you please give us a mailing address. Thank you, again, for doing such meaningful work. 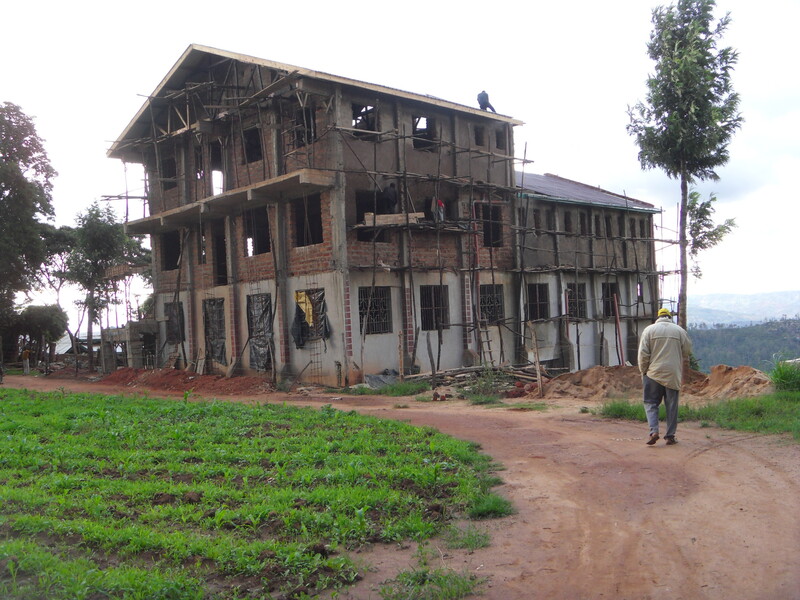 The funds from Our Lady of Peace provided support for the entire Rolling Hills Residence for June 19 – 30 ($600) and the remaining funds were used to purchase building material – windows, cement, wood, plaster and paint to help complete the girls’ residence. The girls will take up residence in the new building by the end of June! 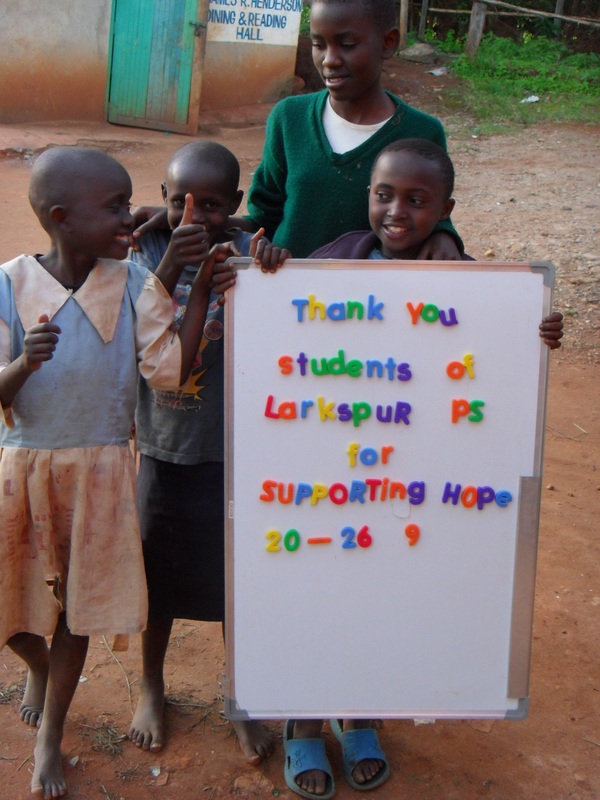 The students of Larkspur raised $350.00 which supported the entire program for 7 days! The students of Conrad Grebel University College, a part of the University of Waterloo, have raised $64.00 as part of our Clean Plate Club, wherein students sign up to waste less food or donate a dollar for every meal they leave unfinished. We would like this money to go wherever it is needed. Christ the King in Whitehorse raised an incredible $2434.56. These funds were used to support the Rolling Hills Residence for the entire month of July ($1500). The remaining $934.56 has been used to finish the Whitehorse Room including plaster, paint, windows and tables and chairs! Below is a note explaining in part how they raised the money. Just a quick note to let you know how we raised the money to support Rolling Hills. During our Science Fair in the fall, we asked for donations upon entrance to the evening public viewing, we ran a canteen for Polar Games ( a territory wide event for grade 5 & 6 students), and sold candygrams at school for Valentines day. The grade 7’s have worked hard, and are thrilled to see their hard work pay off. Thanks to Ruth for the picutres. I have another cheque coming your way soon from “rental fees” in my class (when students need to borrow a calculator or such from me), and from a student donation. Alyssa Bunce recently celebrated her birthday and asked for donations in lieu of gifts. So I am sending along her $100 donation as well!! She has said that “you know best” and can spend it where/how you see fit – “as long as it is helping the kids!” She really is an amazing young lady. 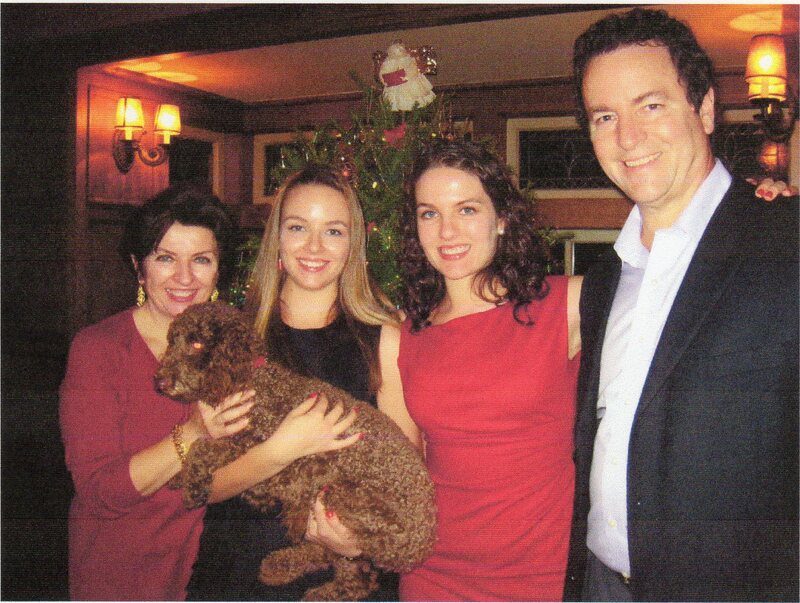 One of our sponsors, Ken Toten, had a birthday party organized by his wife Teresa and daughters. In lieu of presents Ken requested that donations be made to an orphanage in India and The Creation of Hope. His guests were very generous in their donations and then Ken was even more generous – he doubled the amount and split it between the two organizations! 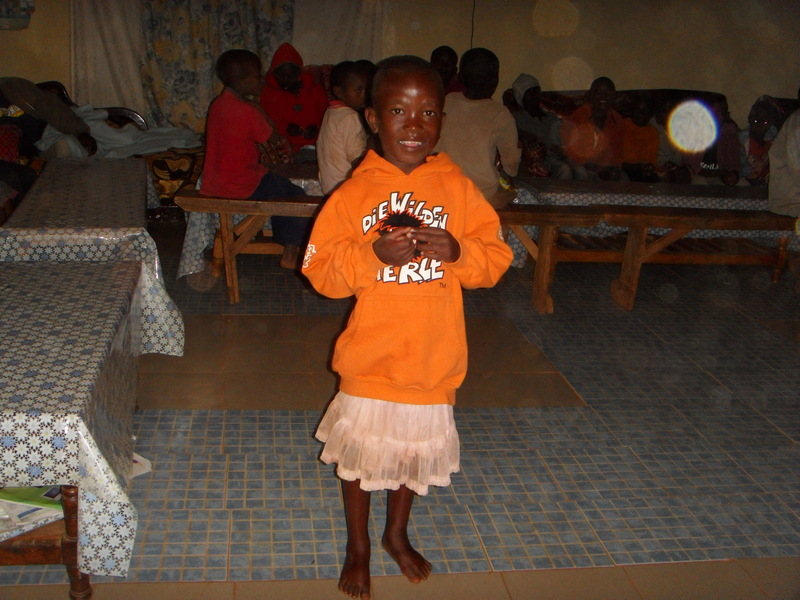 At the end of June Ken and Teresa will be visiting Kenya for a wedding, climbing Mount Kilimanjaro in Tanzania, and coming up to Rolling Hills Residence to meet their sponsored child, Theresia. 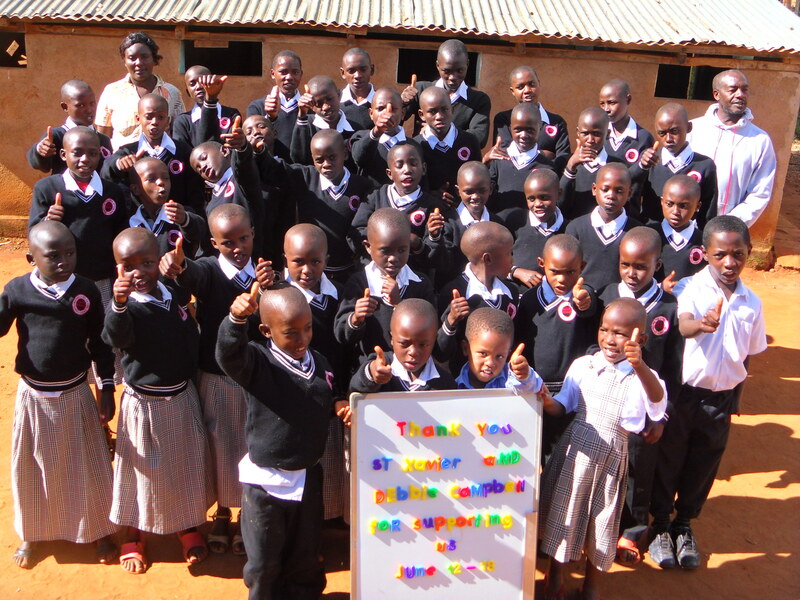 I look forward to meeting them there, introducing them to their sponsored child, and having the children of the program extend their thanks for the incredible support they offered to the orphans of Kikima.